Lyudmila Tkachenko, Dr. of Chemistry, Kiev, Ukraine conducted the following research and came out with startling conclusions that establish that even Shri Mataji's picture emits divine vibrations. With the spreading of Sahaja Yoga, it became well known that water can be vibrated by Shri Mataji, directly by her personal impact or in the presence of her photograph. Many people experienced medicinal properties of such water. Vibrated water doesn't get spoiled when stored for a very long time, like several months. For estimating the quality of the water standard, worldwide accepted, sanitary chemical characteristics, which indirectly characterize the degree of water contamination was used. Several experiments with various sources of water were conducted. 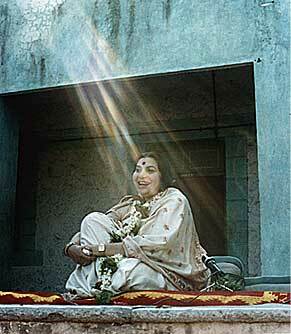 Water taken from a tap in Kiev was placed near Shri Mataji's photograph. Obtained results showed that the effect of vibrations has changed all the characteristics. Effect of purification comprised from 10% to 70%. It is remarkable that the strongest effect occurred for the limited characteristics exceeding the permissible allowance, such as the content of iron and ammonia, the water turbidity. The researchers are very grateful to Shri Mataji Nirmala Devi for the invaluable information and the opportunity given to do this research.